Let’s see…it’s raw, it’s lowcarb, it’s lowfat, it’s high in protein, it’s filled with healthy stuff, it’s dairy & egg-free, it’s gluten-free, it’s legume-free…what’s not to love? Oh yeah, and it is astoundingly delicious and not hard to make either. 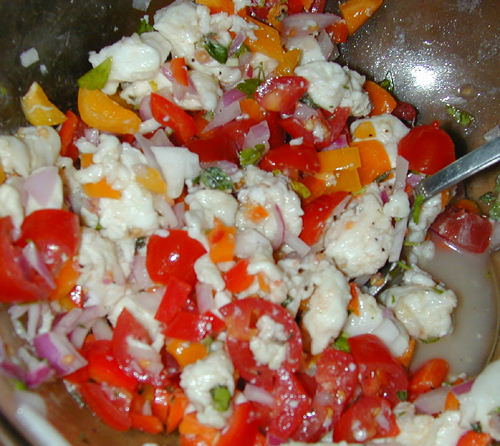 The basic recipe is for Mexican Ceviche at http://www.recipezaar.com/8899. There are as many ways to make ceviche as there are fish in the sea, but I like the classic Mexican. Being kosher at home, I stick with fin fish, though shellfish works very well in the dish. Costco has amazingly good (and very fresh) wild halibut at a reasonable price (be sure to get the fillets). Halibut season starts about a week into March, so it was just in time for this potluck. You can use any firm white fish (or anything really) you like, just be sure it’s good quality with no off smells. Start the recipe at least one day before you plan to serve it. The finished dish will keep in the fridge for several days. Cut raw fish into cubes about 1/2″ wide (don’t worry about being exact, but aim for semi-uniform pieces). Put in large bowl (glass or ceramic is best). Squeeze fresh lime juice over fish (or into bowl first if there are seeds to remove) until the fish is covered. I like to include the pulp. Try to avoid limes that are large and juicy because they are overly watery. Put bowl into fridge overnight, stirring every few hours or when you remember. Remove fish from fridge, drain (not all the way) and save juice. Add the rest of the ingredients, stir, and return to fridge for several hours. Drain excess liquid before serving, mix with the saved lime/fish juice, and put into a cocktail or just drink it. Specific ideas welcome…I’m guessing vodka would be nice. Serve in a large bowl, or on tortillas. I’ve made this a few times now. The pictures are from the most recent time, the Los Angeles Foodlab gathering, and, I have to say, it never really came together. It was good, but never felt like a cohesive dish. Not even after sitting in the fridge for a couple of days. Let me try to deconstruct the differences. I added onion this time; I usually don’t use it. It was definitely a mistake to use yellow: red would have been better. I added back the lime juice I’d drained from the fish (in top picture) because the fish pieces were too big (the hazards of traveling without my own knives; this also led to the herbs being too coarse) and not fully “cooked.” But it meant I never drained the liquid later either, which I should have. Also, it wasn’t quite tomato season yet so some of them were under-ripe. You need the acid juice to help the dish meld. I also left out the hot sauce and pepper because of worries over allergies of the potluck guests. Everyone loved the dish, but I know how good it could have been. Next time I will be more faithful to the recipe. I made a new batch and it turned out amazing. Thank you this blog. My mother and I make this all of the time and it is our fave. The only difference is that we put chicken bouillon in ours. We are haspanic so we use chicken bouillon like it is a religion. Lol.